Apologies for the lateness. But you’re in for a good one! I had a really good reading month! The next three things I read were the graphic memoir Fun Home, the play The Cripple of Inishmaan and the fantastic The Bookshop Book. I finished these three during the Cramathon which you can read about HERE! This is a YA paranormal first in a series about witches. Half Bad is set in a world where black witches are bad and white witches are good. And our main character Nathan is the product of both, his father being the most evil black witch out there. I really enjoyed this! I was intrigued by the world building and the back story. I do wish there was more of a back story but there are two more books in the series to allow room for that. One problem I did have with this book though was at the start of the book, it’s written in second person perspective. And then it changes to first person and remains in first person. And I didn’t get the point of that? This is a YA contemporary about a boy named Ezra who basically goes drops down the popularity chain. That’s it. It felt like every John Green book put together, I couldn’t help but feel like I’ve read it all before. That being said I did find myself invested in the characters even if they weren’t particularly likeable at times. 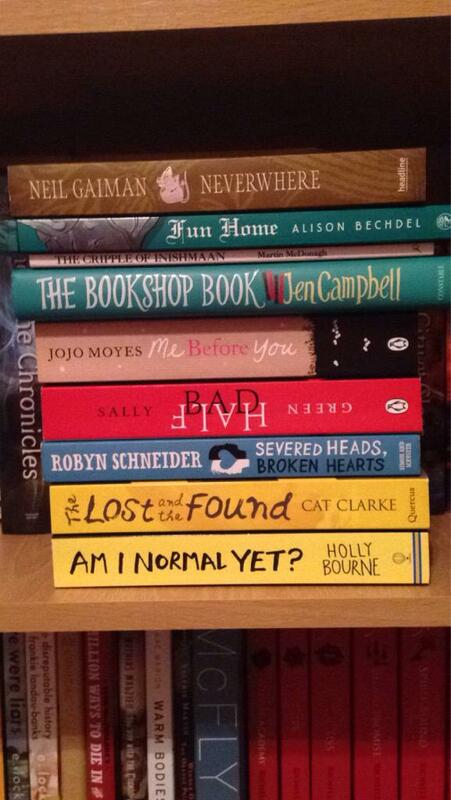 The next two books I read were The Lost and The Found by Cat Clarke and Am I Normal Yet? by Holly Bourne. I loved both of these books so much I promise to do full reviews on them asap! But the goodreads links are there if you’re curious. Previous Previous post: I WENT TO YALC. Next Next post: Am I Normal Yet? – Holly Bourne.